We recently updated our site to be mobile friendly. Please bear with us as we fine tune the site. Is Life Lock the miracle cure for the rise in identity theft scams that we have seen recently? To answer that question we are going to analyze the pros and cons of Life Lock and determine if the Life Lock is the identity theft prevention cure or if you can do-it-yourself and create your own identity theft protection cure. Our question of the day is; What can Life Lock do to protect you from identity theft that you can't do yourself...well up until recently, not a whole lot. It takes some extra work, time and research to do the same tasks as Life Lock, but most of what Life Lock does you can do yourself. Many do-it-yourselfers love research and figuring things out on their own. Other people just have so much going on in their lives that they don't want the added hassle, they just want things taken care of and to know that they are protected, and that is how companies such as Life Lock thrive. So let's look at what Life Lock does and how you can do the same thing yourself. *Note: This site is run by Identity Theft Security, a contracted Affiliate of LifeLock, and is not owned nor operated by LifeLock, Inc. The first thing Life Lock will do is put a fraud alert on your credit profile at all three major credit bureaus: Equifax, Experian and Transunion. A fraud alert will put your credit profile in lock down mode. Creditors will be alerted that they must verify your identification before giving you credit. This makes it much harder for someone to open a new account in your name. Can you place a fraud alert yourself? You certainly can, as long as you remember to place the fraud alert on your credit profile every three months with all three major credit bureaus for each person in your family who wants the fraud alert on their credit profile. A three month fraud alert is used if you only suspect you may have been a victim of identity theft. Active military consumers are allowed to obtain a one year fraud alert. You can also go for a seven year fraud alert but it will require a bit more effort since you will need to show proof that your identity has been stolen. You will be required to submit to the credit bureaus a copy of a valid identity theft report that you have filed with a Federal, State or local law enforcement agency. After placing a fraud alert on your credit profile, the next step Life Lock will take is to request that your name be removed from all pre-approved credit offers and junk mailing lists. This is a very effective method identity thieves use to steal your identity. Can you make the opt out request for name to be removed from pre-approved credit offers and junk mailing lists yourself? Sure you can, but keep in mind that you may have to make the request numerous times before you are completely removed. You are like money in the bank to advertising companies and they aren't going to give you up so easily. There are three places you should go to make sure your name is removed from all mailing lists. Take note that the credit bureaus might have different opt out requirements. You can send a letter requesting your personal information not be shared or used for promotional purposes. Each of the three major credit bureaus offer a toll-free number that allows consumers to opt-out of all pre-approved credit offers. You can call 1-888-5-OPTOUT (1-888-567-8688) or you can go to https://www.optoutprescreen.com. State departments of motor vehicles (DMVs) keep a ton of personal information about you (just take a look at your driver’s license). The Drivers Protection Act offers you privacy rights concerning your information that is kept on file by DMV. This law sets limits on how your information can be used. A DMV agency is allowed to give out your personal information for things such as law enforcement, driver safety, insurance underwriting, etc. A recent amendment was made to the law which now prevents DMV from giving out your information for other things that includes direct marketing, unless you give them explicit permission. You should contact the DMV in your state for more specific information. The Direct Marketing Association’s (DMA) Mail Preference Service has a five year opt out option that enables you to opt out of receiving commercial mail from various national companies for up to five years. Your name is put in a 'delete file' when you sign up for this service (a $1 fee), and made available to direct-mail marketers. This will only work for junk mailings from companies who use the DMA's Mail Preference Service. Your registration won't stop mailings from other companies that don't use this service. To register with DMA’s Mail Preference Service, go to www.dmachoice.org. The FTC also offers a brochure on Shopping by mail or phone. For a list of publications, write for Best Sellers, Consumer Response Center, Federal Trade Commission, Washington, DC 20580; or call toll-free, 1-877-FTC-HELP (382-4357), TDD (202) 326-2502. Life Lock will also order your credit report from each of the three major credit bureaus. The credit reports sent directly to you. You can also order your own free credit report from each of the three main credit bureaus. Obtaining your credit report every four months is a great option to have and will help you keep an eye on your credit score and any discrepancies listed in your credit report. But getting your credit report every three months is not going to be very helpful if your identity is stolen. You could get your credit report today and have your identity stolen next week. That gives an identity thief almost three months to wreck havoc on your finances until you order your next free credit report, and hopefully the accounts the identity thief is using is being reported by the particular credit bureau you received your credit report from this time. If you want to order you credit report then do-it-yourselfers can order your credit report from any or all of the three major credit bureaus at Annual Credit Report by going to annualcreditreport.com to get your free credit report. Just remember to only order one free credit report from one of the credit bureaus. If you order you credit report from all three credit bureaus then you are done for the year and won't be able to receive anymore free credit reports this year. The next service Life Lock offers is a feature they call WalletLock™. The WalletLock service allows you to call Life Lock any time your wallet is stolen and Life Lock will then connect you with a WalletLock specialist who will walk you through the steps in contacting your credit card companies, bank or document issuing company, cancel your accounts and complete any paperwork necessary to replace your credit/debit cards, driver's license, social security card, insurance cards, checkbook, and even travelers checks. Can you do all this yourself? By now you know that the answer is yes. You just need to remember all your cards and documents you have to replace and all your accounts you need to close out. You will also need to track down all the contact information for each organization you hold cards with unless you have done this ahead of time and have this information handy. I don't know about you, but just thinking of going through all that hassle makes my head spin. This feature alone is well worth the price to me. I admit that I am lazy and don't feel like going through all that rigamaroe myself! I want someone to walk me through the required steps and make sure I don't forget anything. I can assure you I won't be thinking clearly and will be sure to forget something. But that's just me, maybe you have your act together better than I do and you have tons of time on your hands. Maybe all that work doesn't bother you since you are a whiz at research and finding the right people you need to talk to (and not an automated answering machine). And maybe it just wouldn't bother you to the point of having your head spinning if all your financial information was stolen. So if you are a 'do it yourselfer' then I say more power to you. Life Lock is now offering two new identity theft monitoring services. These new Life Lock services help you locate any threats that are being made to your identity. These two new services are from TrueAddress™ and eRecon™. The goal of the TrueAddress™ service is to keep an eye on nationwide address databases. If any new address associated with your name is located in any of these nationwide databases, Life Lock will notify you immediately. The TrueAddress alert helps you by making you aware of any new addresses in your name an identity thief is trying to use to have your mail sent to a different location to enable them to set up new credit accounts in your name without your knowledge. The purpose of the eRecon service is to sift through websites that are known for criminal activity. These are websites that are known for illegal selling or trading of your personal information (this would include your Social Security Number (SSN), credit card number and driver’s license). Life Lock will notify you as soon as eRecon™ discovers any of your information being listed on any of these websites. Can you perform the TrueAddress and eRecon monitoring services yourself? Maybe, if you have the proper tools, software and tons of time on your hands. But obviously, it is highly unlikely you would be able to do this monitoring yourself. And the feature that Life Lock is famous for, the Life Lock $1 million total service guarantee. Life Lock states that if you are a member of the Life Lock identity theft protection service and your identity is ever stolen they take every step necessary to reclaim your identity. Life Lock claims they will hire the best lawyers on your behalf, get you top-of-the-line investigators, accountants, case managers, and whatever else you are in need of to restore your identity. Life Lock also states that they will refund any money you may have lost due to the theft of your identity. Many of the services that Life Lock offers can be done by an ambitious Do-It-Yourself (except possibly the $1 million total service guarantee). The real question is whether or not you want to deal with all the hassle by yourself or if you feel more comfortable having someone to back you up. If your a DIY'er and you love a great challenge, then by all means, give it a shot. If you're typical of most Americans who are overstressed, overworked and you would rather have some guidance and help if your identity is ever stolen, then a service such as the Life Lock Identity Theft Protection Service, or even another similar service, might be beneficial to you and your family. Only you are familiar with your situation and only you know what is best for you and your family, the choice is up to you. We hope this Life Lock Review has been helpful to you. If you are still trying to decide on whether to use an identity theft protection service or if your just not sure which monitoring service to choose, you might want to take a look at our identity theft protection comparison page to get the pros and cons to some of the top identity theft protection service providers. 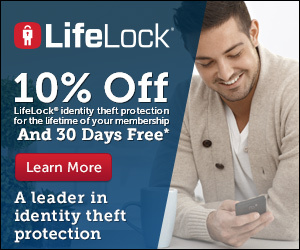 If, after this LIfe Lock Review, you do decide you want to sign up with Life Lock, we have arranged for you to get a 10% discount on your Life Lock Identity Theft Protection Service. The Life Lock promotion code is cj. $99.00 per adult - You save $21.00! $9.00 per adult - You save $1.00! $22.50 per child - You save $7.50! $2.25 per child - You save $0.25! ©> 2004 - 2016 Identity Theft Security. All rights reserved.